About Teak and Wood outdoor furniture cleaning and maintenance. Since teak and wood are natural materials and will always weather and checker. We suggest using a power washer on the lightest setting with a mild cleanser. This process will bring teak back to its golden color. Apply teak sealer to your furniture to help seal and maintain the natural teak color. Adding teak sealer to your furniture helps resist mold and prevents black spots on teak. Paine’s Patio recommends that you store your teak furniture for the winter to protect it from checking or advanced weathering. Contrary to popular belief, teak furniture does not require any special maintenance routine or any additional protection apart from occasional cleaning. 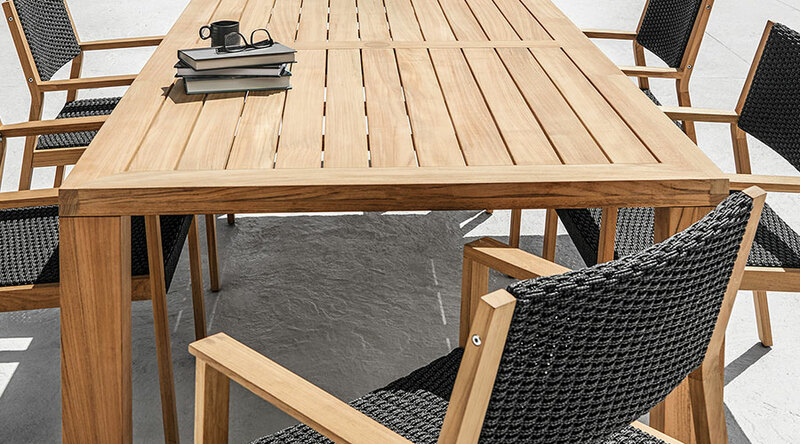 Left to age naturally outside by being exposed to light, air and rain, teak will gradually change to a soft , silver-grey as the pigments in the surface layer of the wood slowly start to fade away. We recommend that you allow your teak furniture to weather naturally this way and simply clean thoroughly once or twice a year with our Teak Cleaner. 25oz / 750ml plastic bottle with trigger-action head. Water-based formula -both non-toxic and environmentally friendly. Cleans and brightens weathered teak in one, simple step. Each bottle is supplied complete with a special applicator pad. 33oz / 1 litre plastic bottle. Water-based formula - both non-toxic and environmentally friendly. Special formula repels water and moisture. Helps prevent stains from food and drinks. Use on weathered teak to retain the silver-grey patina. Each bottle is supplied complete with a special applicator cloth. Make sure the teak is 100% dry and free of dust. It is recommended that you treat your teak furniture with Teak Protector at least once every year. Tabletops should be treated more often. Note: Teak Protector is an almost invisible shield which helps to prevent food(coffee, ketchup, red wine, olive oil, etc.) penetrating into teak causing stains. It also protects the wood against moisture and adhesion of dirt and prevents mildew growth. After aging, the teak will weather to a natural silver-grey patina instead of turning dark grey or green. Should you prefer to keep the golden-brown color of teak for a longer time, then first treat your furniture with Teak Sealer and then use Teak Protector afterwards.